Disappointing news today with British AOR group IN FAITH declared as "terminated" by guitarist Tony Marshall. His statement reads: "For what it matters, which is very little to anyone really. I found out today, via a frontiers press release, that Pete Godfrey had left In Faith to "do an album the right way" with Blood Red Saints. I had no idea this was going to happen and even a brief conversation with pete a few weeks ago ended with a positive response to whether another album was going to be done. It seems not. I wish both Pete's the best for their future with BRS. In Faith has now officially been terminated. Now where did these guys come from? Dropping without a lot of warning comes the debut album from new UK outfit In Faith – featuring the talents of vocalist Pete Godfrey and guitarist Tony Marshall along with drummer Pete Newdeck. The debut was recorded over the space of a year and was just released via Rocktopia Records. This is an impressive slice of classic British AOR, following in the traditions of Dare, Ten and Newman. It has a distinct 80s feel, without being dated and delivers a mix of feel good rockers, heartfelt ballads and those all-important AOR anthems. The first thing I thought when listening to this album is that it sounded like a lost Harem Scarem album. Pete Godfrey has a huge vocal resemblance to Harry Hess and what I’m hearing here is an album that I think would fit perfectly between the debut Harem Scarem album and the classic follow-up Mood Swings. In the same way as the debut Harem album saw a band finding their direction and musical path, so too are In Faith finding theirs and I can only imagine that their second album will be something potentially out of this world. But back in the present, there is already something very special right here. There are some straight forward melodic rockers in the form of the opener Radio and Church Of Rock N Roll, plus All Or Nothing and In Flames. There are a couple of outstanding ballads with the heartbreaking Where I Want To Be leading the pack and the stripped back Leave Me Now. Then there’s those anthems! Does It Feel Like Love is a hit single in another decade; Addicted is Harem Scarem at their old-school best and If That What Love Means is right up there for Song Of The Year – just perfect melodic goodness. If you like your British melodic rock, have a soft spot for the Harem Scarem debut and like your music to represent a bygone era, then In Faith have delivered a very impressive debut that should be right up there on end of year best of lists. Can’t wait for more! Back in the late 80s/early 90s, when Rock was King, Pete Godfrey and Tony Marshall were both involved in various Manchester Rock Bands. It was inevitable that one way or another, their paths would at some point cross. Tony Marshall's name was mentioned when Pete was attempting to put together a Rock band around 1991, they met up in a rehearsal room somewhere in Eccles, they threw a few ideas around but nothing permanent came of this first meeting. About six years later Pete was playing Lead Guitar in a local band and needed to bow out, Tony was the obvious choice, they met up with the intention of working through 20 songs, the truth being Tony listened to about three and said he would be fine with the rest (and he was!). Fast forward through various bands including Contagious, Vaughn and more, Tony Marshall was now married with a young child and apart from being heavily involved with the annual Firefest shows, had pretty much retired from the "Rock Scene". Pete Godfrey had been writing pop tracks for a couple of years after fifteen years away from the industry, enjoying a little success but it wasn't satisfying from an artistic point of view. He decided to spend a few months writing what he felt instead of what he thought and came up with six or seven demos that were definitely Rock based. Pete approached Tony who listened to the tracks but to be honest, wasn't massively impressed with the style. The two decided to meet up to see if they could write together. The ideas flowed but it took time to get up to speed with the advances in recording technologies. It became apparent pretty early on that the material was strong and what was originally intended to be a songwriting partnership quickly gathered momentum and a direction which was crying out for a band situation. To improve the tracks, Tony asked Pete Newdeck who at the time was still the drummer with Eden's Curse as well as fronting his own band Tainted Nation, to help with the drum programming. As an unexpected bonus, Pete Newdeck was also mixing songs in his own studio for his and other artists material, so, obviously, the honourable thing to do was to ask him to mix a few of Tony and Pete's songs, as it would have been rude not to! Pete loved the songs and pretty quickly was drafted in as the third member of the as yet unnamed outfit. In August 2013, during a conversation with Kieran Dargan, the suggestion was made that Tony and the two Petes, write a track for use as the International Anthem for Firefest X. 'Church of Rock n' Roll' was that track and it was about this time that the boys decided to name the band IN FAITH. Over the next several months, songs were written, rewritten tweaked and improved until they were deemed ready to be presented as demos to a select group of trusted friends now known as "the Jury". The comments were pretty much phenomenal across the board, with some very positive critique offered which was taken onboard (and only discarded when nobody was looking!!). Once the decision was made to give "the project" a name, the push was on to complete an album. Favours were called in from several friends: Chris Green of Rubicon Cross plays a solo on 'Addicted', Furyon's Pat Heath adds his considerable talents to 'Radio' and 'Learn to Fly', and Brooke St James of Tyketto contributed a guitar solo to the track 'Where I Wanna Be'. In Faith's debut album 'There's a Storm Coming' was mixed and produced by Pete Newdeck and co-produced by Tony Marshall. It's taken two years to get to this point and we hope you agree with us that it has been worth all the work! Rockunited.com - 5/5 "Future Classic"
UK melodic hard rockers IN FAITH will release their full lenght debut album "There's A Storm Coming", on October 24 worldwide via Rocktopia Records. The emergence of a new melodic hard rock band from the once thriving scene in the United Kingdom these days represents almost a major achievement considering the massive decline in the quantity of bands now plying their trade in the tried and trusted genre of melodic hard rock. The words “tried and trusted” by no means suggest that IN FAITH are simply a run of the mill, by the numbers type of band. Far from it; IN FAITH are taking the traditional parameters of hard rock and AOR and blending them together into a majestic accumulation of screaming guitars, soaring choruses and sumptuous melodies capable of raising every fist for miles or extracting tears from stone. IN FAITH consists of Tony Marshall (ex Contagious, Pride, Vaughn), Pete Newdeck (ex Eden’s Curse, Tainted Nation) and the previously unheard of vocalist extraordinaire, Pete Godfrey, having performed with numerous local bands as a bass player before the revelation that he indeed possessed a God-given talent as a lead singer. 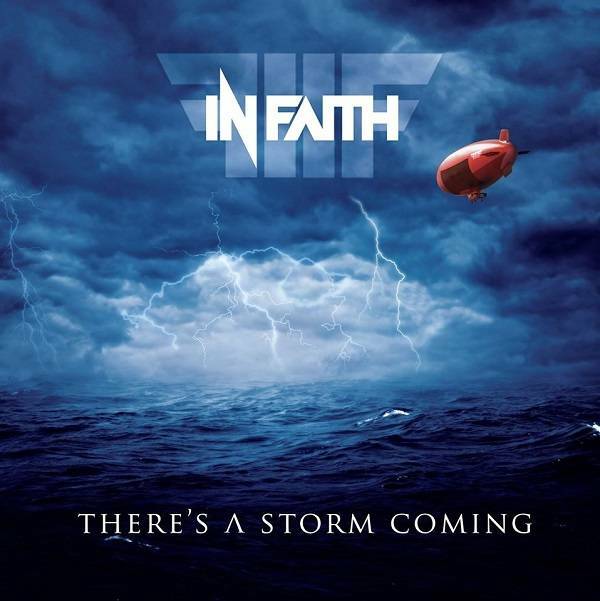 The debut album from IN FAITH, ‘There’s A Storm Coming’ represents everything that is great about British melodic hard rock: heavy, loud, in your face, soft, silky and absolutely unforgettable, all ingeniously blended into what surely is one of the best debut albums by any British melodic rock band of the past 15 years. From the glorious lead single ‘Does it Feel like Love’ right to the closing notes of ‘Bitter End’, ‘There’s a Storm Coming’ is one of the finest melodic hard rock albums you are liable to hear. Featuring guest appearances from Brooke St James (Tyketto), Chris Green (Rubicon Cross, ex Pride, Furyon) and Pat Heath (ex Furyon), IN FAITH have delivered an album brimming with melodic gems that really demands everyone sit up and take notice and once again proudly raises the British flag to the fore of the melodic rock world. Melodicrock.com: "The sound? Think classic Harem Scarem (the debut especially), throw in some Tyketto, H.E.A.T and some more Harem Scarem and you’ll get a good idea of what’s going on here. I've had a few listens to the whole album and there's a few tracks that are definitely going to figure in the 2014 MelRock Awards. Does It Feel Like Love and If That's What Love Means are two sure fire Monster AOR tracks and then there's also Million Ways, Addicted and In Flames." Fireworks Magazine: "In Faith is the debut album and brainchild of Tony Marshall (Contagious, Firefest) and new vocal sensation Pete Godfrey, with stellar drummer Pete Newdeck (Eden's Curse, Tainted Nation) supplying the back-bone, backing vocals and excellent mix. The band's debut sees a glorious mix of Danger Danger, with flavours of HEAT Tyketto and Scorpions." There’s a newcomer to the British melodic rock scene that shows so much promise that the new band might just find themselves featured on many Best Of 2014 lists. IN FAITH will release their debut album via Rocktopia Records at Firefest in October of course! The band features guitarist Tony Marshall (Contagious, Vaughn), drummer Pete Newdeck (Tainted Nation, Eden’s Curse) and vocalist Pete Godfrey. The sound? Think classic Harem Scarem (the debut especially), throw in some Tyketto, H.E.A.T and some more Harem Scarem and you’ll get a good idea of what’s going on here. I’m had a few listens to the whole album and there’s a few tracks there that are definitely going to figure in the 2014 MelRock Awards. Does It Feel Like Love and If That’s What Love Means are two sure fire monster AOR tracks and then there’s also Million Ways, Addicted and In Flames. There are rockers too of course – the high energy Danger Danger style of Church Of Rock N Roll and wonderfully moody Bitter End. It’s a big traditional old-school British AOR albums folks…mark it down on your calendars for October. Back in the late 80’s/early 90’s, when Rock was King, Pete Godfrey and Tony Marshall were both involved in various Manchester Rock Bands. It was inevitable that one way or another, their paths would at some point cross. Tony Marshall’s name was mentioned when Pete was attempting to put together a Rock band around 1991; they met up in a rehearsal room somewhere in Eccles, threw a few ideas around but nothing permanent came of this first meeting. About six years late, Pete was playing lead guitar in a local band and needed to bow out. Tony was the obvious choice so they met up with the intention of working through twenty songs, the truth being Tony listened to about three and said he would be fine with the rest (and he was!). Fast forward through various bands including Contagious, Vaughn and more, Tony Marshall was now married with a young child and apart from being heavily involved with the annual Firefest shows, had pretty much retired from the “Rock Scene”. Pete Godfrey had been writing pop tracks for a couple of years after 15 years away from the industry, enjoying a little success but it wasn’t satisfying from an artistic point of view. He decided to spend a few months writing what he “felt” instead of what he “thought” and came up with 6 or 7 demos that were definitely rock-based. Pete approached Tony who listened to the tracks but to be honest, wasn't massively impressed with the style. The two decided to meet up to see if they could write together. The ideas flowed but it took time to get up to speed with the advances in recording capabilities. However, it became apparent pretty early on that the material was strong and what was originally intended to be a song-writing partnership quickly gathered momentum and a direction which was crying out for a band situation. To improve the tracks, Tony asked Pete Newdeck — who at the time was still the drummer with Edens Curse as well as fronting his own band Tainted Nation — to help with the drum programming. As an unexpected bonus, Pete Newdeck was also mixing songs in his own studio for his and other artists’ material, so, obviously the honourable thing to do was to ask him to mix a few of Tony and Petes’ songs, as it would have been rude not to! Pete loved the songs and pretty quickly was drafted in as the third member of the as yet unnamed outfit. Over the next several months, songs were written, rewritten, tweaked and improved until they were deemed ready to be presented as demos to a select group of trusted friends now known as “the Jury”. The comments were pretty much phenomenal across the board, with some very positive critique offered which was taken onboard. Furyons Pat Heath adds his considerable talents to ‘Radio’ and ‘Learn to Fly’, and Brooke St James of Tyketto contributed a guitar solo to the track ‘Where I Wanna Be’. In Faith’s debut album ‘There’s A Storm Coming’ was engineered and mixed by Pete Newdeck and co-produced by Pete Newdeck and Tony Marshall. Described by the UK’s FIREWORKS magazine as being “the best British melodic rock debut in almost twenty years”, we believe the album has been well worth all the hard work over the past two years. And we’re sure you will agree!